Frederick Raffa Ph.D. & Ed Wolpert Ph.D. Retained by attorneys representing both Plaintiffs and Defendants, alike, RCE has been involved in many high-profile cases through the years including retentions on behalf of Wal-Mart, Dollar General, Petsmart, Big Lots, DuPont, Siemens, Walt Disney, Teledyne International, Equity Residential, JP Morgan Chase, Florida Hospital, United States Golf Association, the City of Orlando, Orange County Florida, the State of Florida, and by plaintiffs in the BP-oil spill cases. 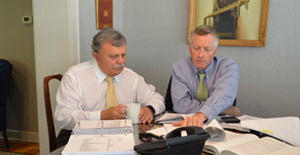 Our experience in measuring damages runs the gamut from Contract Disputes, Torts, Fraud, Business Interruption, Dealer/Franchise Disputes, Construction and Crop Damages, Intellectual Property and matters involving claims of Antitrust violations. Dr. Raffa and Dr. Wolpert have both been qualified as expert witnesses by the State of Florida Judicial Circuit Court System and the U.S. Federal Court System.